Gene also served on the Vintage Aircraft Board of Directors for many years. Two of his personal restorations still reside in the EAA Museum. A 1933 Davis D-1-W and a 1929 Church Mid-wing. Rest in peace Gene. I truly enjoyed, and will deeply miss your friendship. 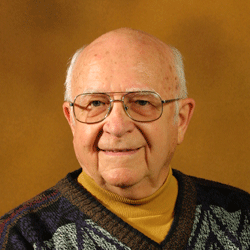 Gene R. Chase, 92, one of EAA, VAA, and sport aviation’s all time truly great people died peacefully Monday, January 2, 2017 in Tulsa, Oklahoma. Gene’s death followed wife Dorothy’s demise of November 21, 2016 six weeks to the very day. 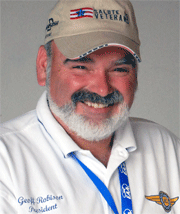 In addition to Gene’s many aviation accomplishments he served many years as editor of Vintage Airplane and later as a VAA board member and was a Director Emeritus until the time of his death. Fellow VAA Director Emeritus Charles W. Harris has written a beautiful tribute to Gene and Dorothy which shares how much they both meant to the success of the VAA. 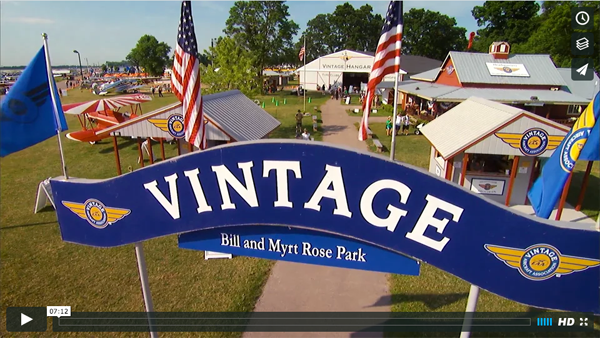 Ever try to explain the AirVenture OSHKOSH experience to someone who has never been there? Much of the footage in this video was captured by our own Vintage Pioneer Video team of Bob Lumley and Erich Roider. Many thanks to Erich, Bob, JT, and the entire EAA Video team for jobs well done. I did not realize the large role Ron played in the Vintage Aircraft Association until he left for Oshkosh a few weeks before the accident and after his passing when VAA members started reaching out to me. I have discovered many friends of Ron through this organization so I wanted to make sure all of you had the correct details for his Celebration of Life. During her sophomore year of high school, a coworker of her father’s knew of Young Eagles rides taking place. 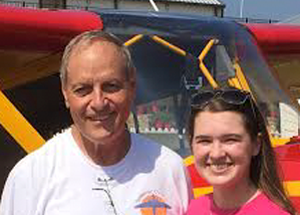 Cayla took her first small airplane ride at the Young Eagles rally at PeachState Airport in Williamson, Georgia. All of us remember the day we set off on our first solo. I soloed three years ago in a Piper Cub. 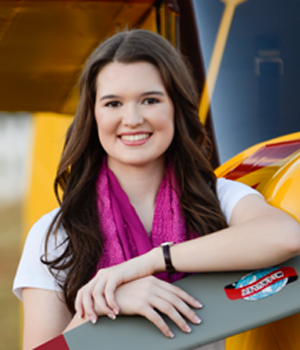 I asked Cayla about her first solo – were you afraid, nervous, excited, etc.? Her comment was “I wasn’t excited or nervous, but I was confident. I acted like Ron was in the back seat and I just pretended it was a normal flight.” I laugh at this because looking back, I did the same thing on my solo. 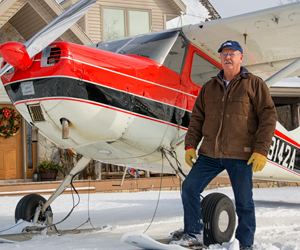 Meet Don Kiel (VAA #15132)and N8142A his 1952 Cessna 170B on Federal Hydraulic Retractable skis with Ultra-high-molecular-weight polyethylene (Poly). Don hasowned42A since 1985 andflown on skis since 1990. Don is fortunate to have his own 1000 x 65ft strip, unlisted, very private, located at his home in northeastern Wisconsin. Don didn’t fly into his strip in the winter until this year when he put the poly on his skis. He says the the Poly is night and day difference from aluminum skis. In the past he had to have a friend push the airplane to get it moving. With the poly the airplane will move with ease at 1/4 throttle. Carl Ben Eielson was one of Alaska’s most famous pioneer bush pilots. 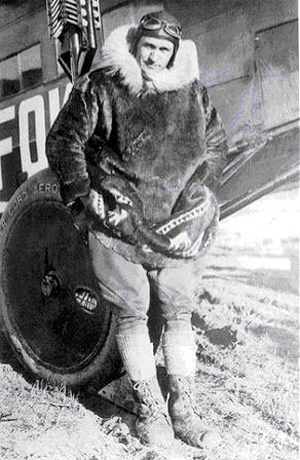 He had many OUTSTANDING FLIGHTS, one of which was making Alaska’s very first air mail test flight on February 21, 1924. 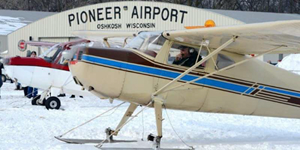 On Eielson’s return flight, however, a few problems surfaced as he relates in the following article. Eielson was born in Hatton, North Dakota in 1897 and learned to fly during World War I. After discharge from the U. S. Army Air Service in 1919 he enrolled in law school but alternated his studies with barnstorming tours in the Midwest to satisfy his interest and love of flying. In 1922 he accepted a position teaching at a high school in Fairbanks, Alaska, but soon devoted his future to flying full time for a company that delivered supplies and passengers to mining camps and settlements around Alaska.